Saw this on my trail run today and got a laugh. It's easy to see how this came about — verbs get translated with "to" mindlessly stuck in front of them. Mindful of the fact that this sign is in China, not Taiwan, I typed lājī (actually just laji) into Google Translate to get 垃圾, but the pronunciation that was returned is lèsè, which is used in Taiwan. It's interesting that, if I type lese into Google Translate, it won't give me the characters (垃圾). I think the convention of always citing English verbs with a "to" in front of them is a questionable practice. It's nice to indicate the part of speech, I suppose, but then you get ridiculous stuff like more people believing the "split infinitive" rule. I recently saw an entry in a translation guide that rendered a word into English as "to must, to have to". That's "to must", pesumably as in "If you try to do that, I'm going to must stop you. In this case, though, I don't think we can blame "to" for the bulk of the problem. There's little pragmatic difference here between an imperative and and adjunct of purpose, except the latter sounds more like a suggestion than a request, so the imperative is better. I think the more serious problem is the lack of "your" before rubbish, which makes it sound like you're being asked to take rubbish other people have left, though I didn't have trouble understanding the intended meaning (and joke) translated as is. @Guy: I agree that the convention of citing English verbs with a "to" in front of them has little to be said for it. I presume it arises from the old practice of basing English grammar on Latin grammar: if we say "amare" in Latin, then we say "to love" in English. Perhaps it's my years in Kenya and travel through Europe in the '70s, with the resultant wide exposure to multi-lingual signage and English as a second language, as a kid, but I see absolutely no problem at all with the sign. But then again, "to preserve memories [generally of others, in the future]", I've always seen no problem with picking up a few extra scraps of trash beyond what I might have brought in, if I see them and it's not too inconvenient or dangerous to do so, always mindful of some of those who have gone before doing the same so that I may enjoy my own memories, with the knowledge that not everyone carries out their own, so it'll get worse if others don't carry out a bit more than their own. FWIW, I routinely grab the farthest out shopping cart (and sometimes two or three) I can reach conveniently and return it to the store, when I'm shopping, as well, using the one and leaving it much closer when I'm done. Same reasoning. Similarly if I find garbage or misplaced items on the shelf in the store, tho in that case I'll often take it up with my purchases and ask the cashier to dispose of it as appropriate, if it's too far out of place or a cooled item out of cooling for too long. Of course in these cases it's generally without a sign urging me to do so, and indeed, I'd wonder at a sign actually asking me to do it. But a sign asking me to help keep an area clean by removing any trash, certainly my own, but even not necessarily my own, if it's convenient, seems routine enough, to me. What am I missing? Is it simply that the same is not implied by the original, that it implies *only* your own trash? In my experience, Latin verbs are cited in the first person singular present active indicative ("amo"), not in the infinitive ("amare"). It's possible that this is a modern convention, though; I understand that while the standard case order today is nom-gen-dat-acc-abl(-voc), accusative used to come second. I agree with Duncan that the request to take away rubbish needn't be read as referring only to one's own rubbish. That's not the problem with the translation. 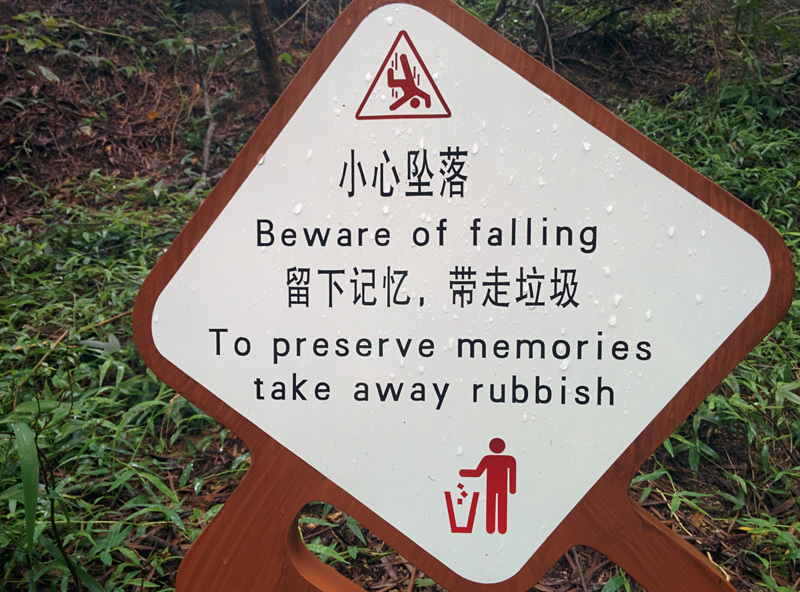 The problem is that it seems to suggest taking rubbish home to remember. The main point, I think, is that a pithy parallelism in the original has been mangled in the translation. "To escape with the dessert, drop the weapon now" doesn't have the nearly same punch as "Leave the gun. Take the cannoli." I assumed that was an intentional joke/pithy phrasing of sorts, similar to "take only pictures, leave only footprints" – "take your trash with you (as if it were a souvenir)". Though now that I think about it more carefully, I suppose it's likely "preserve memories" was intended to mean "keep this place as you remember it". Gregory, Guy: No, I think you were right.